Dr. Mahesh Reddy has always been a forward thinker who thrives on challenging himself. He spent 5 years in England to learn a medical super specialty becoming one of the first shoulder specialists in India. He proudly notes that shoulder surgery is amongst the most difficult surgeries to perform and is the latest super specialization in Orthopaedics. Ever since starting in medicine, he knew that he wanted to open a hospital and worked tirelessly toward realizing that goal. started an initiative with Iskcon (Tirupati) which feeds over 10,000 children per day in Chittoor district in the midday meal programme. Dr. Reddy’s wife, Aishwarya Reddy and his two daughters, Sanjana Reddy (16yrs) and Vaishnavi Reddy (11yrs) are based in Bangalore. Suresh Soni, Founder, Chairman & CEO of Nova Medical Centers, recognized the gaps in the Indian healthcare segment: scarcity of specialized surgical care, very expensive real estate, very significant gaps or alternatives from tertiary care corporate hospitals and the unmet aspirations of doctors to have ownership and management interest in the Corporate healthcare institutions. Mr. Soni conceptualized and launched a unique business model that addresses these shortcomings and inefficiencies, and meets the aspirations of doctors. The aim was to have “doctor owned and doctor managed centers that provide world-class healthcare, and still be accessible and affordable”. The Nova idea gained significant momentum when Mr. Soni met Dr. Mahesh Reddy. Introduced through a common friend, they quickly realized they shared similar visions. Having completed his medical studies in the UK, Dr. Reddy had always wanted to build and own a hospital and also contribute to healthcare delivery and growth of the country. The meeting with Mr. Soni opened a new avenue for investment in healthcare delivery and Dr. Reddy became convinced of the merits of forming a chain of short-stay surgical centers, especially given the fact that he had seen the efficiencies of this concept during his stint with the NHS in UK. After returning from England, he rapidly became one of the most prominent surgeons in India eventually establishing and heading the Manipal Shoulder Clinic. He actively engages in numerous professional medical associations. He was also witness to the efficiencies of clearly laid out and strictly followed protocols the way of functioning that he wanted to carry with him wherever he would setup his practice. Dr. Reddy was keen to be associated with this novel idea tweaked to suit the India scenario and perform a bigger role within the company. In spite of his busy practice, he committed family funds to making a substantial investment and his addition to the management team contributed credibility and clinical expertise to the company along with his strategic guidance. In 2011, the founders felt infertility treatment sector in India was unorganized and a large number of people did not find comfort in the process and technology available in the country. This realisation led them to set up the infertility business initiative. With 7 centers across India and 5 more underway, Nova IVI Fertility is addressing the growing need for standardised, ethical and latest technology in infertility treatments and is the largest chain in India. Nova IVI Fertility brings the latest infertility treatments to India through its partnership with IVI Spain, the world leaders in Assisted Reproductive Technology. IVI Spain has one of the best rates of pregnancies in assisted reproduction worldwide with 90% success rate over 4 cycles. As a result, IVI has helped in the birth of over 65,000 healthy babies worldwide. IVI also has a dedicated research foundation that has given rise to new treatments & procedures which are shared with Nova. Mr. Soni and Dr. Reddy worked relentlessly to set up 18 centers in a short span of 5 years. Dr. Reddy holds the credit for being the first doctor in India, who specializes in treatments exclusively for shoulder related injuries. Dr. Reddy has been conferred with many awards and honors for his invaluable contributions to the medical world. He received the Bharat Jyothi Award in 2008 for excellencein the field of medicine. In the year 2011, he was awarded the Medical Healthcare Innovation Award. 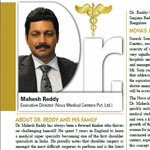 Dr. Reddy was featured in an article titled “Hidden Gems of India” in the August 2013 edition of the Forbes Magazine. Dr. Reddy was also recently awarded the Frost and Sullivan ‘Healthcare Entrepreneur of the Year 2013’ award for Nova’s most promising and innovative business model, which has made an impact on the healthcare industry. He founded the Watanabe Cadaveric Course in India with the aim to provide training for Shoulder Arthroscopy Surgeons. He is the Secretary of the Shoulder and Elbow Society of India and Organizing Secretary of the annual Bangalore Shoulder Course. He is an Executive Member of the CII National Committee for health and Vice President of Indian Society of Ambulatory Surgery. He is also the Reviewer of two internationally renowned Orthopaedic research journals- The Journal of Bone and Joint Surgery – England and the British Journal of Shoulder and Elbow Surgery. He has many publications to his credit and has also attended conferences and seminars across the globe and rendered lectures on various shoulder topics as guest faculty. He is a member of many prominent associations like the Indian Orthopaedic Association, Indian Orthopaedic Society in UK, the Karnataka Orthopaedic Association, Indian Arthroscopy Society and the Bangalore Orthopaedic Society and also Advisory Board Member of WWFKarnataka (World Wildlife Fund). The opening of the first center brought with it complications on the insurance front. Insurance companies used to only cover procedures with hospital stays lasting more than 24 hours. This was done to prevent fraud. In the Nova model, many patients would be discharged on the same day. Insurance companies were unaware of the concept of short-stay and day-care surgeries and that the surgeries could be 15 – 20% cheaper than other hospitals. The founders had to overcome insurance companies’ skepticism of the short-stay surgery model in order for Nova to be successful. Nova is the first group toget over 700 procedures approved for the same day discharge. Dr. Reddy’s first inspiration is his father who is a proponent of simple and Satvik living, inculcating the thought of service to society. Dr. B. N. Muddu, an orthopaedic surgeon in England, is his Godfather and fuelled his interest in shoulder surgery specialization with a never say die attitude. Dr. Reddy has also been inspired by Dr. K. Srinivasan, the senior most orthopaedic surgeon in Karnataka and entrepreneurial surgeons like Dr. Devi Shetty & Dr. Naresh Trehan.